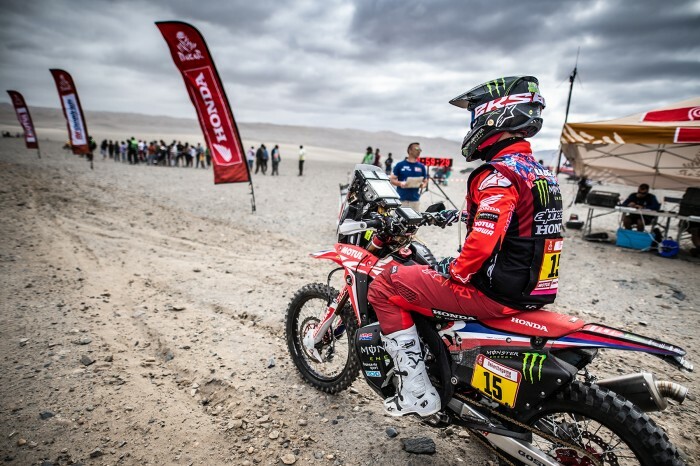 Monster Honda’s Ricky Brabec returned to the 2019 Dakar overall lead after Pablo’s Quintanilla could only muster 14th place. Brabec took third overall after an early battle with eventual stage winner Sam Sunderland and comfortable over the terrain that included dunes and was fast enough to mark the third best time of the day some 6’30” off the stage winner. The American now holds a 7’47” advantage over the nearest second place rival Frenchman Adrien Van Beveren. “Yeah, I needed a good stage, I needed to push up and get to the front. It wasn’t easy, I think I was riding too fast, you know, riding faster than I should have, but no close calls today, actually no close calls the entire rally, so that’s a plus and I’m keeping my fingers crossed for that until the end,” said Brabec. “I needed a good stage today to get me back on top, and tomorrow hopefully is a little bit easier navigation than today but, you can never be too sure until you’re actually out there and navigating.